Grace Brett might be the oldest living street artist in the world. 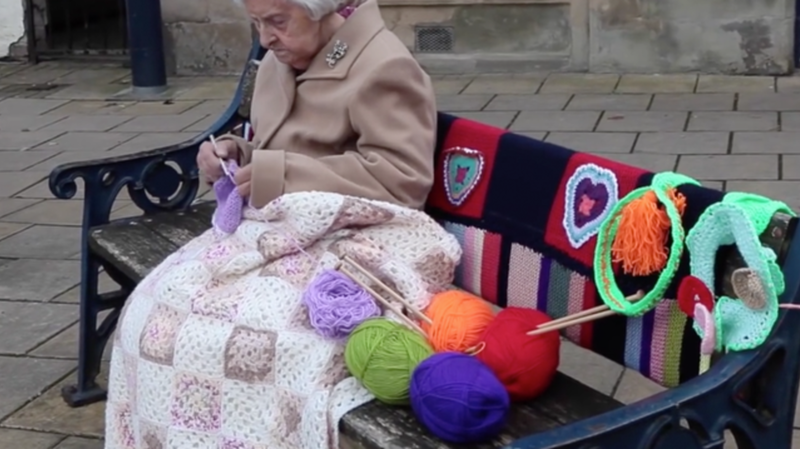 The 104-year-old grandmother of six is a member of a knitting club known as the “Souter Stormers,” who recently yarn-bombed the towns of Selkirk, Ettrickbridge, and Yarrow in Scotland. The “Stormers” spent nearly a year secretly planning the project, which was part playful prank, part street art installation. The mischievous knitters took to the streets this month, covering fences, benches, and lamp poles all across the towns in elaborate knitted art. There were colorful knitted houses, animals, and little yarn families. But though their art is playful, the project was no joke for the secret knitters—the owner of a textiles shop in Selkirk reports that “the words ‘I could tell you but I’d have to kill you’ passed the lips of the knitters several times” as they prepared for the massive yarn bomb event. Check out the video below, and more photos of the yarn bombing at the Daily Record.